In the famous exchange between Jesus of Nazareth and the Roman ruler Pontius Pilate, Jesus is recorded as claiming “everyone on the side of truth, listens to me.” Pilate dismissively responds, “What is truth?” and walks out of the room. Two years ago Twitter said that 23 million of its 271 million users were not people, but “bots” – programs that automatically generate content based on an algorithm. According to BuzzFeed founder, Craig Silverman, during the recent election, “fake news” was more popular than “real news.” Total Facebook engagement with the top twenty “fake news” election stories was greater than the top twenty “real news” stories. According to the independent, Pulitzer-prize winning watchdog organization PolitiFact, 70 percent of the U.S. president-elect’s campaign statements were rated as Mostly False, False or Pants on Fire False. And he won! But it is not just a campaign thing. Recently we’ve seen Volkswagen claim their diesel engines to be environmentally friendly. But they weren’t. There was the Toshiba executive who said they made an extra $2 billion in earnings. But they didn’t. And then there was Wells Fargo who gave extra credit cards. Without asking. Truth isn’t popular. It exposes you to seeing and hearing things you don’t like. That you are not perfect. That you are oftentimes wrong. That sometimes you hurt people – maybe many. That whatever it is, most of the time it’s not about you. We don’t like Truth. So we avoid it. We cover it up. We change the subject. What are they? Truthfully? They are lies. Truth has an annoying way of hanging around. 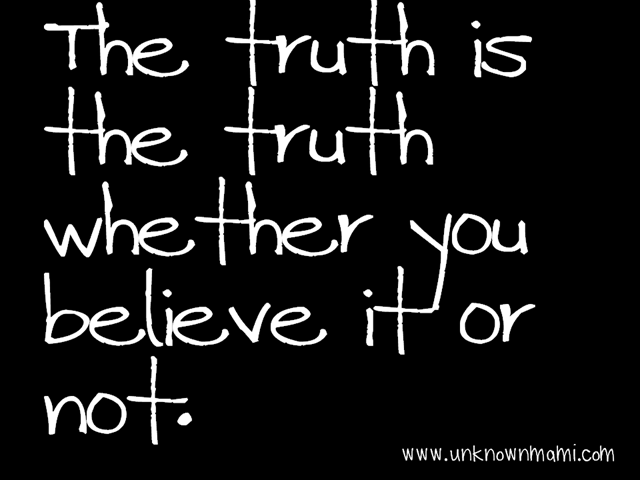 Just when you think you’ve beaten it, killed it and buried it … Truth shows up. Maybe not the next day. Or the next. But one day. And at some point, things either are or are not. No amount of prevarication or mendacity can prevent Truth from having the last word. I’m betting on truth. It might lose a battle or two but it always wins the war. That, I believe, is true. Thank you, Jerry. You’re so right. Truth has a way of eventually sneaking back into the picture.